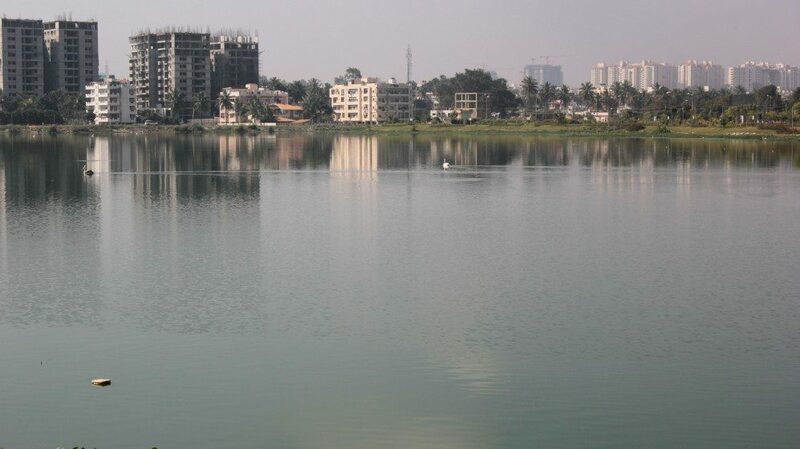 Rachenahalli is one of the few living lakes of Bangalore, in the north of the city. It is connected to water bodies upstream and downstream, particularly Jakkur Lake in the northeast. 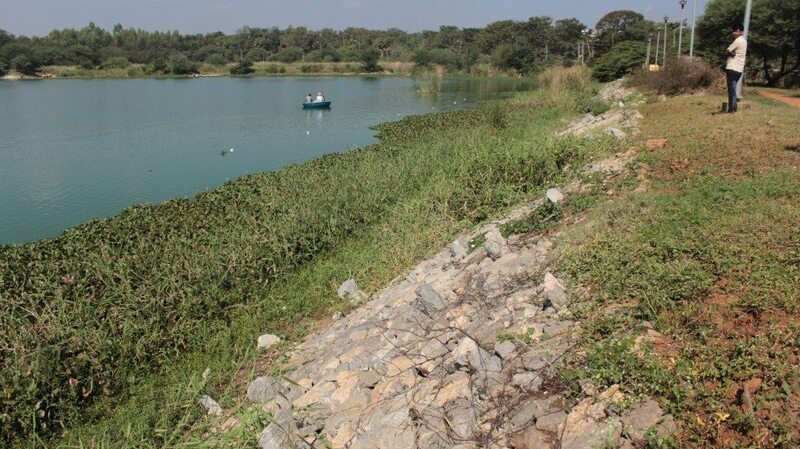 Both of these lakes have been rejuvenated, at substantial cost, by the Bangalore Development Authority over the last decade. 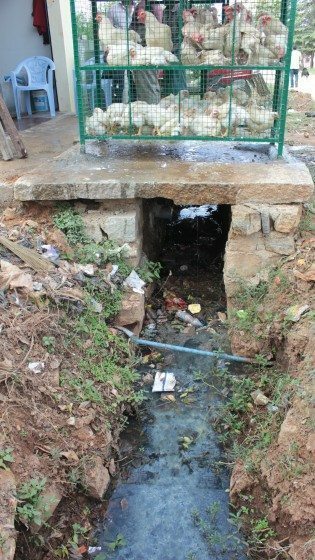 A sewage treatment plant with a capacity to treat 10 million litres a day was set up north of Jakkur Lake by the Bangalore Water Supply and Sewerage Board (BWSSB). Water from the sewage treatment plant flows into Rachenahalli when Jakkur Lake overflows during monsoon. 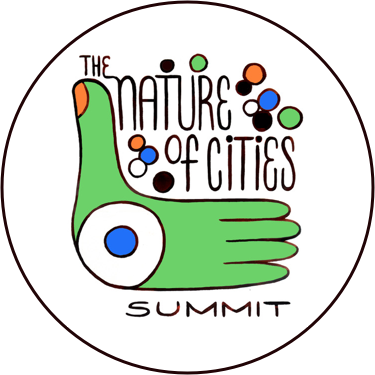 Rachenahalli is an example of a thriving social ecological system—it continues to live and to support life. 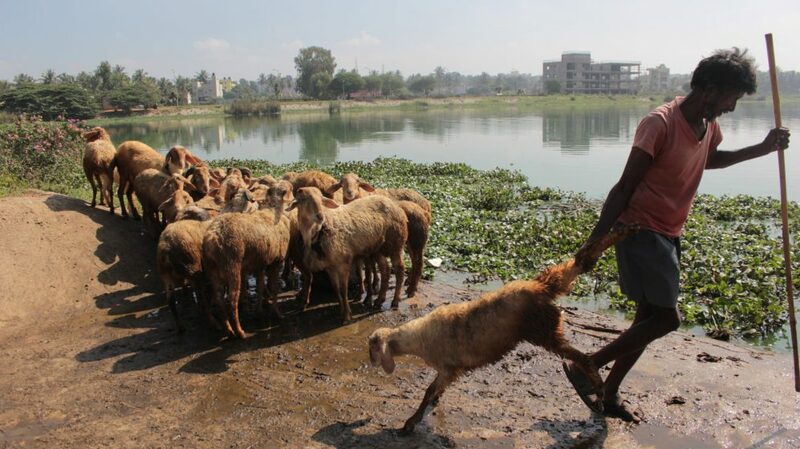 Rachenahalli is an example of a thriving social ecological system—it provides natural resources to people living around it, acting as a sink for fisher folk cleaning fish or for women doing Sunday laundry and receiving treated sludge from new residences around the lake, as well as from an upstream sewage treatment plant, the lake continues to live and to support life. 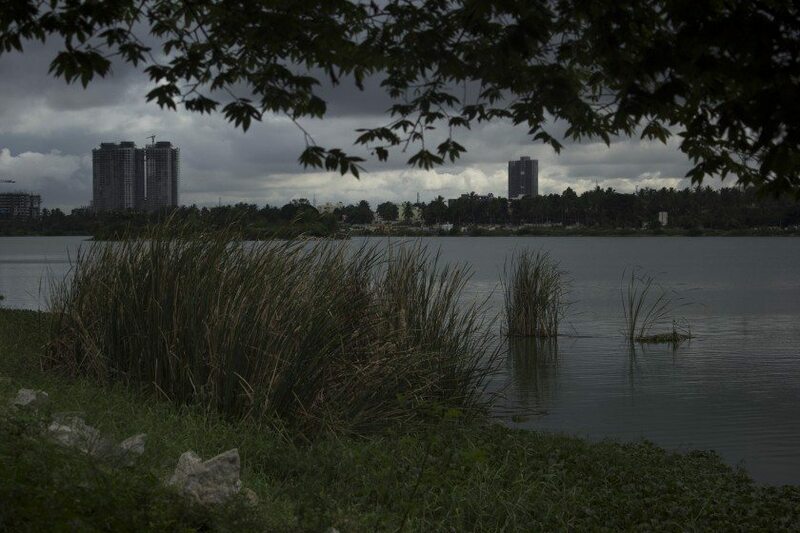 The author and photographer, Sumetee Pahwa, has been living in the vicinity of the lake for the last three years, since her return to India from Cape Town. 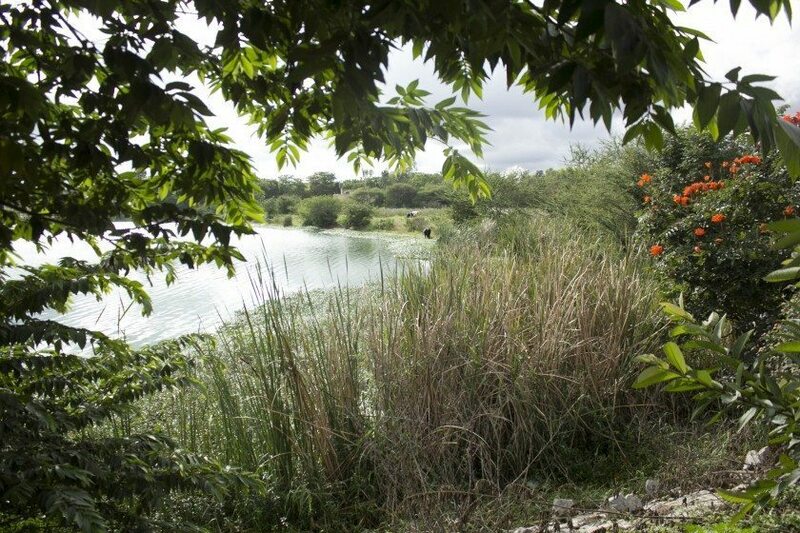 The lake and its living waters inspire and intrigue Sumetee. 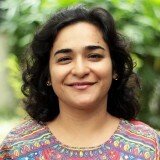 More recently, she has taken an active interest in the many ways that people derive resources from the water body and its surrounds. 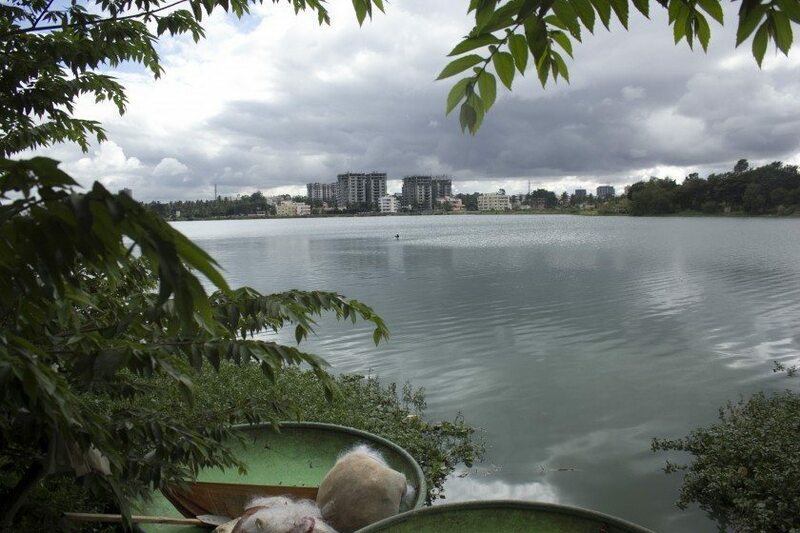 Molded fishing boats straddle a bountiful lake as new residential developments herald high-rise living into Bangalore’s peri-urban areas. Treated wastewater from most of these high rises will end up in the lake. Cleansing The Sheep, One. 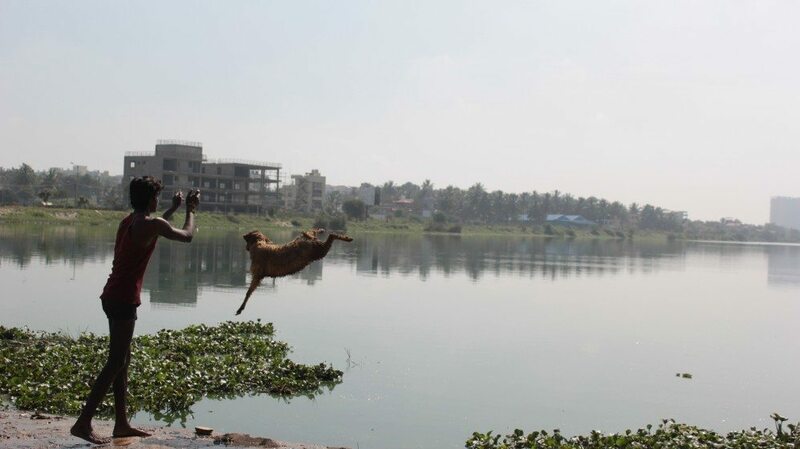 Manjunath, a shepherd from Amruttahalli, throws one of his sheep into the lake before giving it a thorough soap and scrub. Cleansing the Sheep, Two. Manna pulls along the next sheep picked for its sunny Sunday morning fling, dunk, and scrub. High Definition. Clumps of bulrushes rise above the water; clumps of concrete define the boundaries of Karle SEZ (Special Economic Zone) in the distance. The SEZ abuts the Outer Ring Road, connecting Hebbal to KR Puram. Guardians of the Lake. Children of migrant construction workers from Bihar learn Hindi, English, and Kannada in a local school. While their parents work on a new commercial building overlooking the lake, the children play in fresh mud. Stealing a Ride. Rupa and Bhagya in the Royal Enclave property owner welfare association (REPOWA) park. Normally, this park is off limits for domestic helpers and their children, but road upgrades around the lake have unlocked many doors! What’s Under the Pavement? 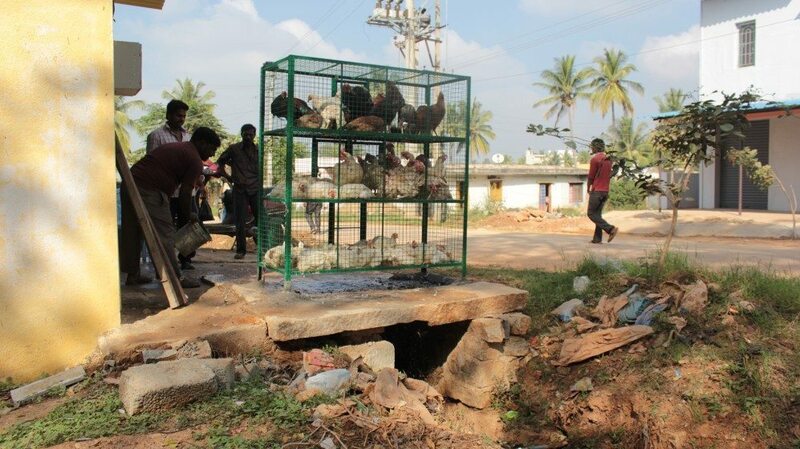 A shop owner throws water beneath the chicken coop, which washes off bird excreta into the drain below. 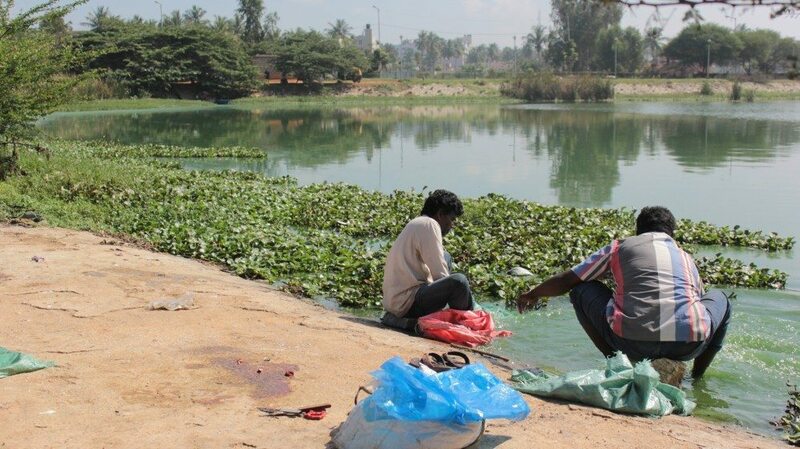 The drain empties into Rachenahalli Lake. Blue. 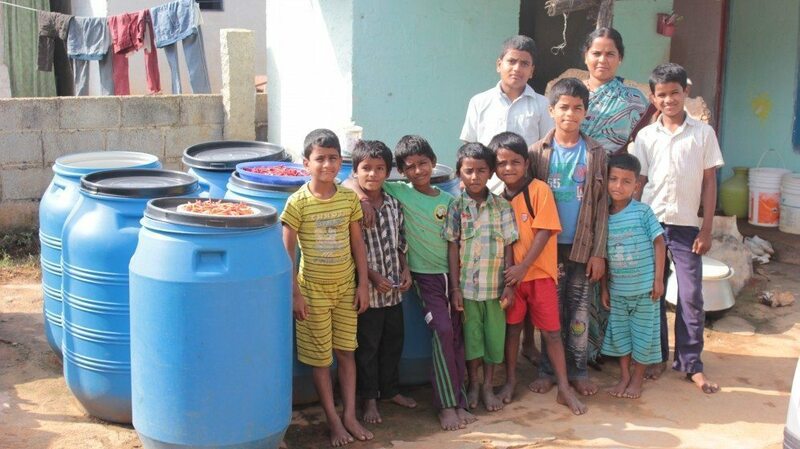 Seven drums for seven days of water, which comes from the municipal pipe servicing this residence. Mom, her three sons, and their friends pose alongside the chilies drying atop the drums. Yellow. A wealthier resident draws water from a well on her property. The well water comes from the lake. Fish Market, One. The man weighing the fish runs a thriving business next to the lake, with minimal financial investment. Fish Market, Two. 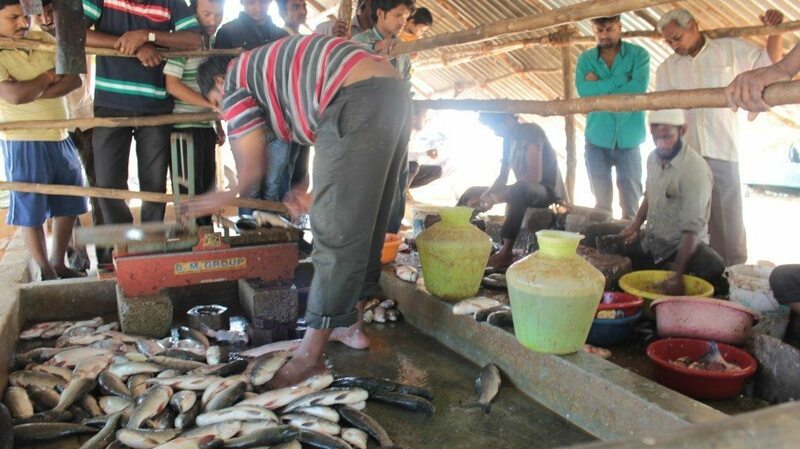 Extra help for cleaning and cutting the fish is needed on weekends, when families buy in bulk for an extra sumptuous meal. Scales Off, Innards Out. 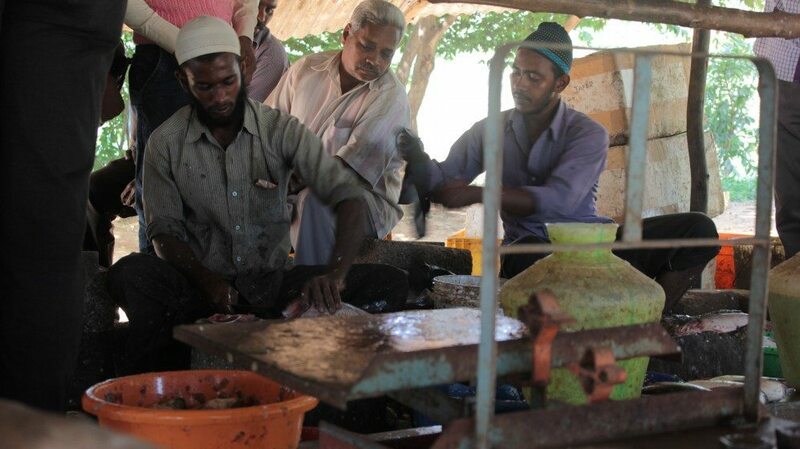 Two fishermen prepare their catch for sale at local eateries. 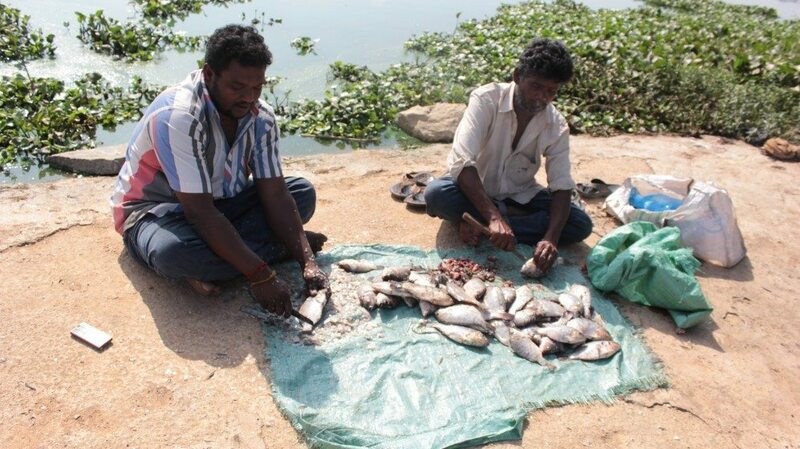 They throw the innards of the fish back into the lake, as food for other organisms. Cleaning the Tools. 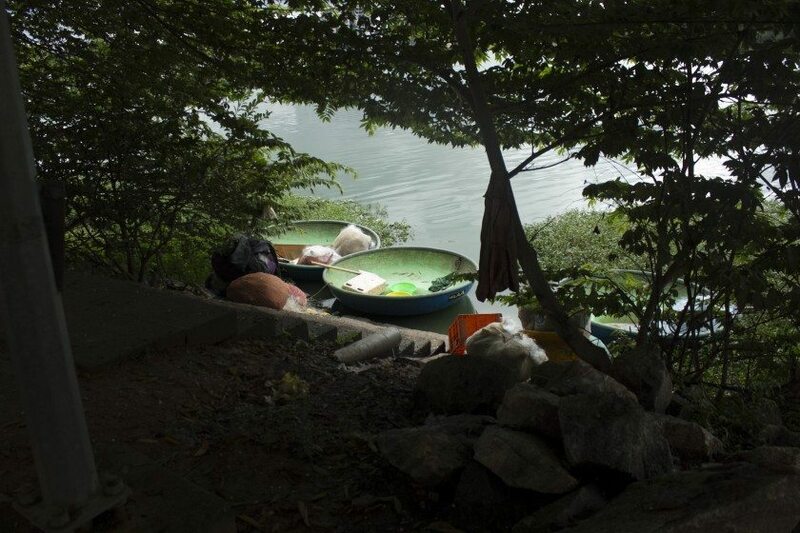 Bags, knives, slippers, feet, and hands are all immersed in the lake waters. Solar Energy. 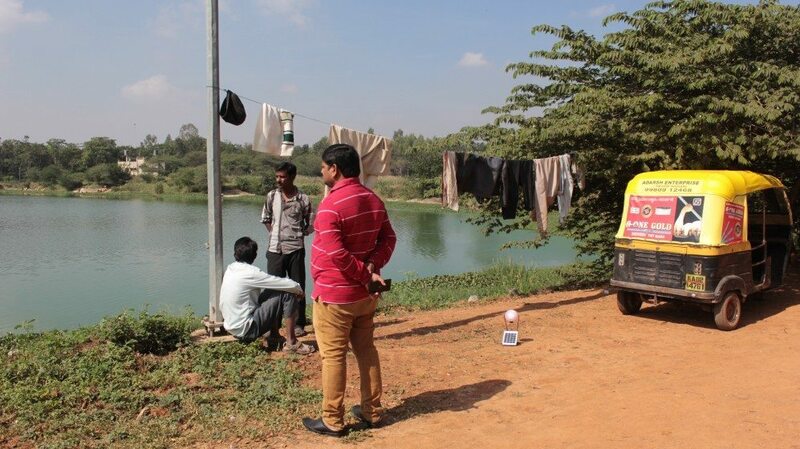 A solar panel charges a night lamp and a cell phone while the fisher folks’ clothes dry in the strong sun. Across the lake is the Mahatma Gandhi Institute for Rural Energy and Development, with solar panels on its roof and wind generators in the compound. Reflections and Perturbations. Two pelicans leave trails behind them on a very still surface that reflects new and old residential complexes. The Godrej apartments on the far right are almost three kilometers away, on the New Airport Road. Succulent Borders. Cows can graze along the idyllic lake shores since the paved areas have soft boundaries with adjoining roads, private properties, and public parks. Safely Docked. Three fishing boats rest for the night, carrying rolled up fishing nets, thermakol seats for the fisherman, and small oars. The waters get rough during extreme rain events, but for most parts of the year, this spot, a few steps down from the fish market, is fairly protected. 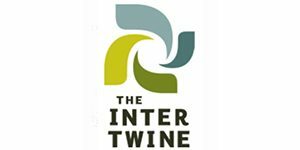 This article originally appeared at the India Water Portal.